Count Basie opens his autobiography recalling the first time he heard the Blue Devils and the impact they had on his music and his career. “Basie had come West with a show. He couldn’t play the blues then…. “They would balleyhoo in front of the show, take a band and play a number, and have fellows singing…. One of most influential bands from the early days of Kansas City jazz was Walter Page’s Original Blue Devils. 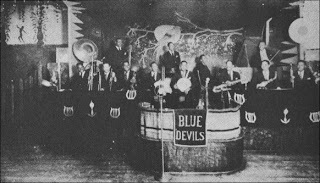 A territory band which spent winters in Kansas City but traveled the Midwest, some of the greatest names associated with KC jazz were once a Blue Devil. Bassist Walter Page, who would anchor Count Basie’s orchestra, was there at the start, in 1923. Bill Basie joined in 1928. Other Blue Devils included saxophonist Buster Smith (joined in 1925, profiled here), singer Jimmy Rushing (1925), drummer and vocalist Ernie Williams (1925), trombonists Dan Minor (1927) and Eddie Durham (1928), trumpeter Oran “Hot Lips” Page (1928), and saxophonist Lester Young (1932). Page took over and renamed the band in 1925, then expanded it to 13 pieces. “The biggest upset we ever had in our life…happened to be in Sioux City, Iowa…and it was a battle of the bands between Page and Jesse Stone. We got up there on the stand first because we were considered like a house band there. We played there regularly. Well, we started out with some of our light things, little ballads. And [the Blue Devils] hit right off the reel, wham, and they didn’t let up all night long. They had a tough band. They were just sharper, cleaner, more powerful, and they had more material…. Bennie Moten began to raid the Blue Devils for musicians. Basie left for Moten’s band in 1929, followed by Lips Page, Jimmy Rushing and Eddie Durham. Walter Page left and joined Moten in 1932. Buster Smith, Lester Young and Ernie Williams were still with the Blue Devils when the band fell apart in 1933 in Virginia. The last seven Blue Devils hoboed on trains to St. Louis. When Moten heard, he sent a car to pick up them up and hired all seven. Quotes by Basie are from his autobiography, Good Morning Blues. Quotes by Jimmy Rushing are from the book, The World of Count Basie. All other quotes are from the book, Goin’ to Kansas City.